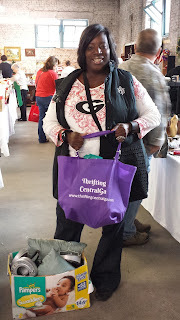 Thrifting Central Ga. : I Supported Historic Macon and Their Cause! Historic Macon Foundation's vision is to lead Middle Georgia as the premier preservation organization. Our Mission is to revitalize our community by preserving architecture and sharing history. Imagine: tomorrow’s lifestyle in yesterday’s places. 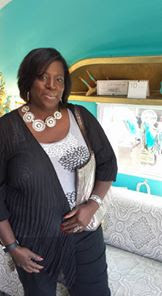 As Written by Emily Hoskins in her weekly Blog for Historic Macon. 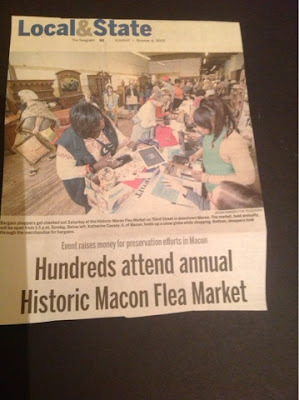 Did I mention that 77¢ of every dollar you spend at the Flea Market goes straight back to Historic Macon’s operating expenses? That means 77¢ of your dollar goes directly to the work that we do best -revitalizing our community by preserving architecture and sharing history. You can rest easy in that new-to-you bed or chair from the Flea Market knowing you got an incredible deal and you also supported an organization committed to making Macon a better place. I even got snapped by the Macon Telegraph photographer ( Jason Vorhees) ! !